Everyone from 15-year-olds to seniors is invited. Interviews for potential volunteers — with details provided about a training course in March — will be held on Wednesday, Feb. 13 and Thursday, Feb. 21, on both days at 5 p.m. You need attend only one. “Volunteering here is fun and personally rewarding, and it’s also vital to fulfilling The Maritime Aquarium’s mission of educating and inspiring guests about Long Island Sound,” said Lisa Slinsky, assistant director of volunteers and community service. 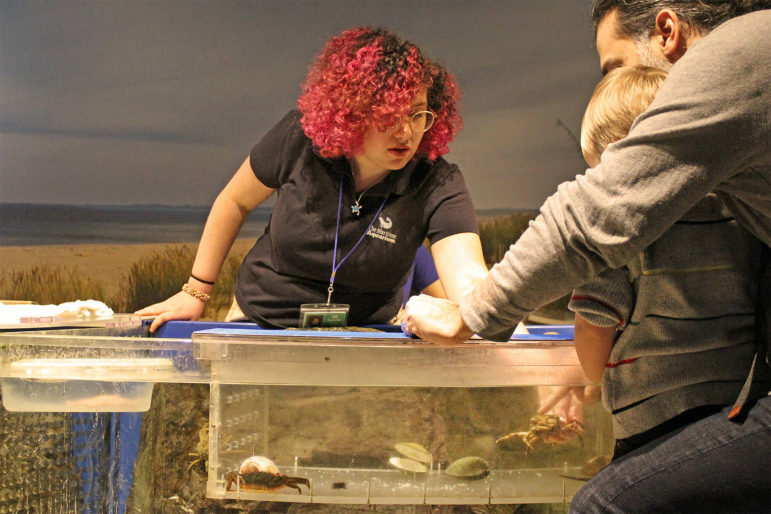 Sign up to learn how to interpret exhibits — such as the Intertidal Touch Tank (shown here) — for guests. Prior knowledge about marine animals isn’t necessary to be a Maritime Aquarium volunteer. That’s what will be taught in a four-week training course, which will meet at 7 p.m. on Tuesdays and Thursdays from March 5 to March 28. To get more details and learn how to sign up go to this Web page on the Maritime Aquarium website or call (203) 852-0700, ext. 2225.